To provide an opportunity for developing and developed countries to share experiences about past and on-going water policy reforms and to identify key factors for improving the prospects for success. 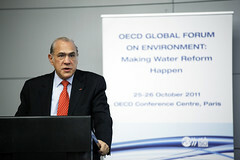 The Global Forum gathered over 250 participants from both OECD member and non-member countries, including senior government officials, sub-national authorities, and regulators; business leaders; leaders of non-governmental organisations and other civil society organisations; and leading water experts. The OECD Environmental Outlook to 2030 has identified water as one of the four critical environmental priorities for the coming two decades. Agriculture is responsible for approximately 70% of water use worldwide. Agriculture is a major user of land and water resources and has significant environmental impacts. Water can be perceived as a local concern, however its efficient, sustainable and equitable management requires an integrated approach involving multiple stakeholders. Countries the world over face mounting challenges in providing safe and affordable drinking water and sanitation services – from meeting the water targets in the Millennium Development Goals to complying with increasingly stringent environmental standards.